Hi, I'm Scott Kelland, owner of award-winning New Terra Farm. I'm also the author of several books about market gardening and small farming. 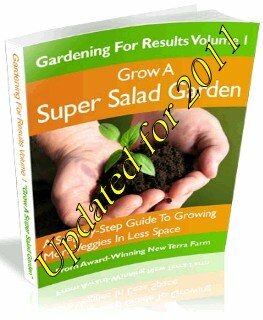 Now, I've just finished the 2011 version of 'Grow a Super Salad Garden' for the home gardener. Just enter a valid email address in the form below, and you will be able to immediately download 'Grow a Super Salad Garden'. And I will keep your contact information just between us; I never sell, rent or share email addresses for any reason. Period. Why don't you have a garden? - Don't know what to grow? I'll give you exactly what seed to buy, where to buy it,and step by step instructions to grow it to have a Super Salad Garden of your own. ps and if you are new to gardening, a salad garden is a great way to start; its easy to grow (and your kids will love it too). 2. Pac Choi. This crisp asian green grows quickly and is great raw or braised e.g. in stir fry. It is a good source of vitamin C, calcium and vitamin A. 3. Chard. Swiss chard is a very productive green that can be eaten raw in salads or as a braising green. Chard is a good source of vitamin A, vitamin B1, vitamin B2, Iron, Potassium, Magnesium, and Calcium. A mix of chard, kale and spinach makes a super nutrition salad! 4. Cucumber. Tasty, crispy cukes are easy to grow when you know how. The secret is 1) row cover; and 2) grow them UP. Cucumbers will keep producing as long as your keep them picked. 5. Kale. This is another green that will produce all season long if you keep the lower, outer leaves picked. Kale is a good source of vitamin A, vitamin B1, vitamin B2, vitamin B3, vitamin C and Calcium. 6. Lettuce. While lettuce in general is not a spectacularly nutritious food, some kinds are more nutritious than others (and what’s a salad garden without a some super fresh lettuce?) Grow the ‘butterhead’ and ‘romaine’ types for biggest benefit. These varieties provide vitamin A, vitamin B1, vitamin B2, vitamin B3, Calcium and even a little iron. 7. Mesclun (a ‘mild’ mix and a ‘spicy’ mix). This mix of baby greens provides many nutrients including phytochemicals important for health. Most mesclun mixes are ‘cut and come again’; that is, you can harvest them when the plants are 3-4 inches tall, by cutting the plants off with scissors about 1” above the ground. They will re-grow in 2-3 weeks to provide another harvest. 8. Peppers. Pound for pound sweet peppers provide more vitamin C than most citrus fruits, and contain modest amounts of vitamin B1, B2 and B3. Pick varieties that are good to eat 'green' or red. 9. Radish. While there is not a lot of nutrition in radishes, they do add some 'bite' to your salad, and they are quick and easy to grow. 10. Spinach. This hardy green is another nutritional star, supplying vitamin A, vitamin B2, vitamin C, Iron, Potassium, and Calcium. Spinach can be served raw or cooked. All these great salad veggies can be grown in our 50 sq. ft. Super Salad Garden. What will I learn in 'Grow a Super Salad Garden'? how to care for your plants - step by step instructions for planting and caring for your garden, to keep it producing all season long. Whether you are a 'newbie' or an 'old pro gardener' looking to get back into the game, this is an easy way to get started gardening. Download Grow a Super Salad Garden for FREE! 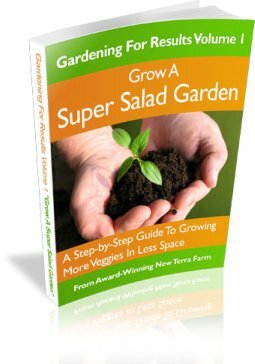 Just enter a valid email address (one you can access later) and you will receive the Super Salad Garden book automatically. 'Grow a Super Salad Garden' is an e-book; you will be able to download it and your bonus book immediately after completing the form above and get started growing right away.